CAMI Research Inc. (Acton, MA) has many international customers enjoying the benefits of CableEye®. If you are inquiring from outside the USA, please refer to our list of international distributors and contact a distributor assigned to your country. If none is listed for your region, you may order directly from us in the USA, in which case you should refer to the section on 'Direct International Sales'. 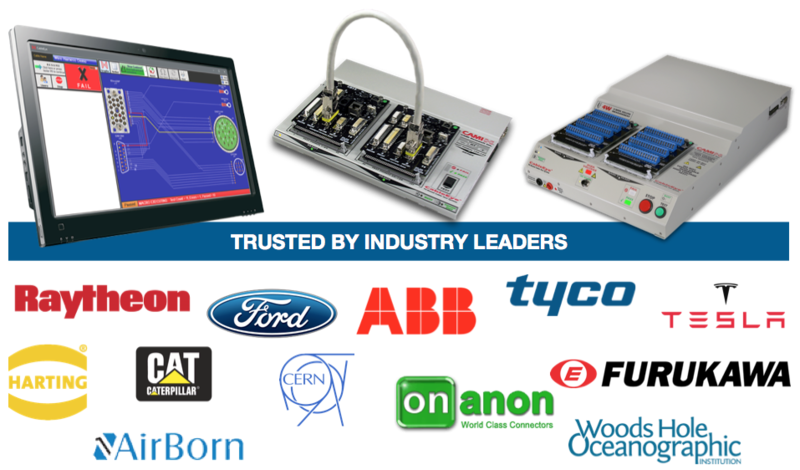 CAMI Research is the only authorized seller of CableEye within the US and Canada. The output connector is a standard 2.5mm circular DC power jack. Any foreign-style power module that provides this output will be adequate. At your preference, we will either ship the USA-style power module, ship no power module, or provide the proper power module for your country and advise you of any additional cost. Our HiPot units (HVX series) plug directly to 100 - 250Vac, 50-60 Hz, 130W (max) power for 128 TPs, 175W (max) power for 512 TPs with IEC-standard universal C14 chassis plug. The on-line help system, Getting Started Guide, Software Introduction Booklet, and User's Manual are in English. 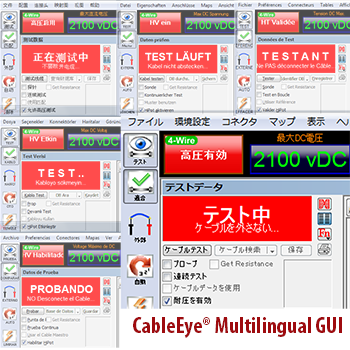 Our software may be configured for English, Chinese, French, German, Japanese, Korean, Spanish, or Turkish screen labels. Macro instructions written within our standard software and intended to be read by an operator (including but not limited to rich text work instructions with images) may be written and displayed in any language. Work instructions can be coupled with operator text to speech conversion to form a totally heads-down work-station. For all other technical requirements, including software and computer, please see specifications. The same warranty that applies to US buyers also applies to foreign purchasers. You receive a one-year warranty on parts and labor for hardware support (excluding shipping), and will receive software updates & upgrades for one year at no charge. We have found the hardware to be extremely reliable, so it is unlikely that the test fixture will pose any problems under normal use. Additional benefits are included with the warranty. Click the link for details. Click here for on-line catalog. Please contact your local authorized distributor for local prices. If there is no local distributor for your region, and you contact us directly, note that quoted prices are USA only and subject to exchange rates, freight and import costs.